There is no doubt about it, opposite, is the face of evil. He is the Norwegian, Anders Behring Breivik, who last Friday exploded a bomb in Oslo (undoubtedly to distract the police), then went about 25 miles away to the island of Utoeya to shoot and kill scores of innocent youngsters who were attending a summer camp. There are already people saying that he must be mentally ill to have carried out such attacks, particularly as his lawyer said that "his client felt he had done nothing reprehensible". I'm tired of mental illness being used as an excuse for every type of atrocity, and given the fact of the lengthy, detailed planning that went into these attacks, he knew exactly what he was doing. Reports indicate that during the weekend interrogation, he admitted that the attacks were 'cruel' but 'necessary'. This is not a man who seems to be suffering from mental illness. Before the attacks, Behring Breivik wrote a 1,500 page manifesto. In it he boasted that he was one of up to 80 'solo martyr cells' recruited across Western Europe to topple Governments tolerant of Islam. He is reported to have said in court today, that he was "saving Norway from a Muslim takeover". He has been described as a 'Christian fundamentalist', and in his Manifesto, Breivik calls himself a justiciar Knight, a rank within the Knights Templar. He also makes a call for believers to spawn as many children as possible in order to generate a pool of future fighters in a Christian war he likens to a medieval crusade. 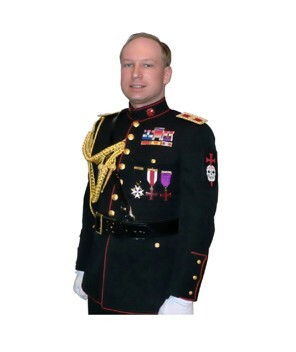 The image of Breivik above, shows him in a uniform with a white and red cross of the Knights Templar. These were established around 1119, during the period of the Crusades. Ten years later they were officially sanctioned by the Church of Rome. Even from the very beginning, there were those who criticised the concept that religious men could carry swords. The leading Churchman of the time, Bernard of Clairvaux wrote a major treatise in support of the Order, and defended the idea of a military religious order by appealing to the long-held Christian theory of 'just war', which legitimised taking up the sword to defend the innocent and the Church from violent attack. He wrote, "A Templar Knight is truly a fearless knight, and secure on every side, for his soul is protected by the armour of faith, just as his body is protected by the armour of steel. He is thus doubly-armed, and need fear neither demons nor men". Little wonder that they went about massacring 'infidels' by the thousands in the name of God. Anders Behring Breivik, as a self-styled Knight Templar was carrying on this work, but why choose to massacre these particular young people at a summer camp has yet to be determined. Is this attack religiously or politically motivated? Those who ask this question speak as if there is a clear line between the two. In my mind there rarely is, particularly when the history of religious fundamentalism shows that nationhood and belief often go hand in hand. How often have we heard President Obama invoke the name of God when America seems to be under threat? To him, God is on the side of the United States. God is on the side of those going to war against the 'infidel'. Christian fundamentalists think nothing of bombing the workplaces, and murdering those who carry out abortions, and all in the name of God. There have been people in most religions throughout history, and throughout the world who have carried out atrocities in the name of their god or gods. "God is on our side" has been the call from so many quarters. I can't help but think how many fewer wars there might have been, if there had never been religion. The Middle East has a long history of faith and territory, of religion and politics. Northern Ireland has a similar history, particularly with the phrase, "For God and Ulster". This was the motto of the Ulster Volunteer Force (UVF), formed at the height of unionist opposition to Home Rule in 1912-1914. This paramilitary force became part of the British Army in the first world war, and who were decimated on the first day of the Battle of the Somme in July 1916. The motto, "For God and Ulster" was taken up by the Ulster Protestant Volunteers (UPV), who were active during 1966-1969 and aimed to prevent the introduction of equality reforms in Northern Ireland. They were a loyalist and extreme Christian paramilitary group, and its political wing, the Ulster Constitution Defence Committee was established by Ian Paisley in 1966. The UPV launched a bombing campaign to destabilise the Northern Ireland Government, and also took part in most of the counter demonstrations organised in response to the Catholic Civil Rights marches of the late 1960's. "For God and Ulster" was thundered from pulpits and streets at religious/political rallies for the next 30 years. To one historian, "for God and Ulster implies divine favour, a special relationship between God and Ulster Protestants, and a loyalty to Britain sealed in blood on the battlefields of Europe". This religious belief has caused the death of thousands. It's not just Islam that is fervent in its determination to subjugate the masses to its will. Christianity has shown over the last two thousand years that it is as capable as anyone of committing atrocities in the name of God. How I wish that religion was dead. Those that know me will wonder how I can say such things with my background. For thirty years I promoted a Christianity that encouraged intolerance - that was not my aim you understand, just the effect. I believed in what was right with a shameful dogmatism, and those who disagreed were simply wrong. I came to despise this until I could take no more. I was defending the indefensible, promoting the unpromotable. I could no longer answer the question, 'Why does God allow ...'. I could no longer believe in a being called God. This God was being used for unholy ends, and I wanted no part of it. But, some will say, what of the good things that in particular Christians have done over the centuries to improve the lot of their fellow man? It was their belief in God that drove them to bring about changes in child labour, slavery, prison reform or working conditions. This shows what good 'religion' has done. I'm the first to acknowledge the fantastic work that reformers have done over the centuries to improve the conditions of fellow human beings, and they deserve great credit for that. But, you don't have to have 'faith' to be a reformer, and without a religious belief, these people would probably still have done great works, for they were good people, intent on doing good things. It's not only 'religious' people who do good things, for if you look here, you will see a long list of atheist social reformers and activists, who have worked for improving the lot of their fellow man in various parts of the world. Religion of course will not disappear. Wars will not cease. Atrocities in the name of 'god' will continue. Religion and politics will continue to be linked. I for one am happy with my condition, but if you must have 'faith' to sustain you, let it be of the highest order, and is something that treats your fellow man in ways that you wish to be treated yourself. The face of evil above, and what it stands for, has no place in this world.